​"I need to wake up. I suppose you won't hit me?" Angie arched an eyebrow at him as she suggested it. Previously, she had been able to sense that Rachel was in trouble during a dream. After trying—and failing—to wake up to help her sister, she had asked Ethan to hit her. Unable to bring himself to do it, he kissed her instead. Ethan flushed at the reminder. "It worked," he offered weakly. Angie was forced to agree. "The cursed painting, trace ail." She closed her eyes and repeated it several times. With a deep breath, she opened them, hoping. But Ethan was still standing there. He shook his head slightly. "Damn." The kiss had worked the first time, not that Angie was eager to repeat it. She hadn't kissed anyone since starting med school. Actually, her last kiss had been well before then, if she was honest with herself. Ethan certainly wasn't someone she wanted to kiss at all, much less a second time. Well, he was kind of cute... no, no, she scolded herself for even thinking it. He was cursed. Then again, he'd stay cursed if she couldn't figure out how to help him. She held out her hands in defeat. "Go for it." He looked confused. "For what?" Angie grunted in annoyance. "Kiss me. Wake me up." "No," she muttered, but beckoned him closer. Hesitantly, Ethan joined her next to the bed and paused, just inches from her. "If you are sure..."
He leaned forward. Their noses were practically touching. Angie stiffened. He was so close. And so real. It was hard to believe this was a dream and that he was practically a figment of her imagination. She could feel the heat of his body. He smelled good, she realized. Angie felt her heart pounding as he hesitated, just an inch away. His lips parted. "The cursed painting," he whispered before she could tell him he better keep his mouth shut when he kissed her. The breath from his words was like a caress on the skin of her cheek and Angie nearly forgot her protest. "Trace ail." Angie swallowed hard. "The cursed painting," she murmured. Her eyes closed; the intense eyes boring into her’s were the last things she saw. "Trace ail." Softly, his lips covered hers. It wasn't a shock this time and Angie found herself gently pressing her lips against his. The cursed painting, trace ail. Nothing was happening. Angie kissed him a bit harder as she repeated the mantra in her head. She felt one of his hands grip her shoulder. His fingers tightened, just a little, almost like an invitation to move closer to him. The cursed painting, trace ail. Angie was practically shouting the words in her head. The kiss was obviously not working. She sighed and prepared to pull away. In spite of her initial resistance, the kiss was nice. Too nice. Angie had a feeling that if she allowed it to continue, one of them would take it a step further. And she honestly wasn't sure it wouldn't be her. Eyes still closed, she pulled away from his lips. "The cursed painting, trace ail," she whispered one more time. "The cursed painting. Trace ail." Angie opened her eyes as she spoke. It was pitch black. "So you said," Ethan said. But his voice was different. "Yeah. Were you expecting Ethan?" Jo's laugh came from right next to her. ​​Sisters Rachel, Angie, and Jo may have survived their first encounter with a curse, but hundreds more are lurking within their aunt’s antique shop. There’s just one problem: Peter, the apprentice, has no idea how to start teaching two untrained rune-casters and keep them safe at the same time. 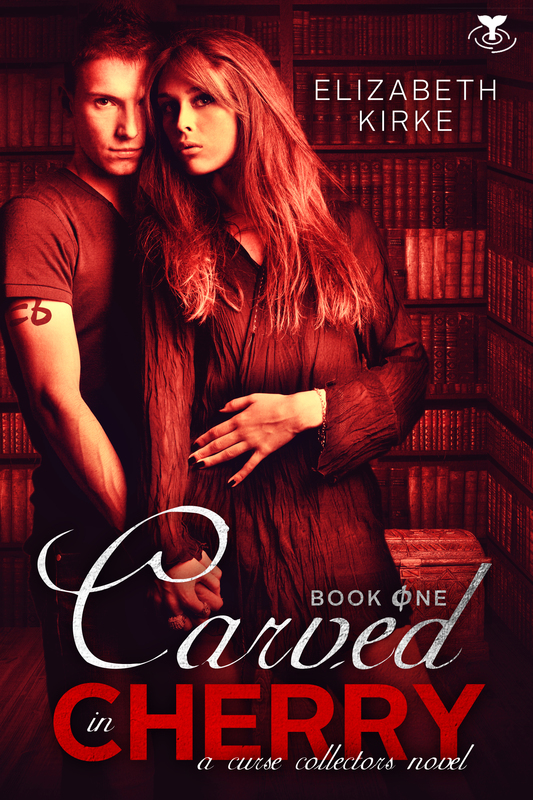 Today is your last chance to grab Carved in Cherry for FREE! Carved in Cherry by Elizabeth Kirke is FREE all week on Amazon. Catch up now before Wrought Iron Roses releases in Winter 2019 with Siren Press. They thought they inherited an antique shop. Instead they got a collection of curses and a duty to break them. Rachel, Angie, and Jo knew nothing about their aunt’s secret life. In fact, they didn’t even know she owned an antique shop, until they inherited it. Unfortunately, Lydia passed down more than just her store. The sisters are the proud new owners of countless deadly curses, buried under centuries of dust. Lydia also left behind her apprentice, Peter. He does everything he can to protect the girls, as they explore their new store, unaware of the dangers it hides. In spite of his efforts, Rachel finds herself obsessed with opening a strange trunk, Angie has vivid dreams, haunted by a man who claims he needs her help, and Jo’s imagination starts to run wild. When one of them falls victim to a curse, it’s up to Peter and her sisters to save her. But, if Peter can’t teach them to wield a magic, that he barely understands himself, she’ll be the first one to die. ​Rachel, Angie, and Jo knew nothing about their aunt’s secret life. In fact, they didn’t even know she owned an antique shop, until they inherited it. Unfortunately, Lydia passed down more than just her store. The sisters are the proud new owners of countless deadly curses, buried under centuries of dust. Siren Press is excited to announce that Carved in Cherry will be available in print starting September 25th! If you are like me, you gotta have the paperback for your bookshelf. You can preorder now from Amazon or Barnes & Noble. Click HERE to order your copy.